This article is from 2007. Judging by the feverish excitement rippling around the auditorium of Pleasance One, even the flimsiest association with the Harry Potter phenomenon can virtually guarantee a successful Fringe show. 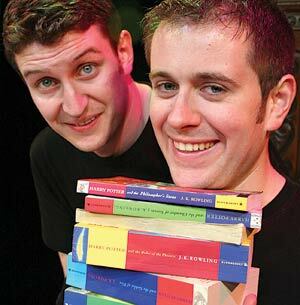 The task facing performers Dan and Jeff is to recreate six of the teen wizard’s adventures (with bonus seventh book teaser) in under an hour – an assignment akin to trying to squeeze the contents of Niagara Falls into a teacup. The pair wisely opt to take as irreverent an approach to the source material as possible, dipping into a rag bag collection of scruffy props and silly wigs to breathe goofy life into some of the epic series’ most memorable set pieces. Pleasance Courtyard, 556 6550, until 27 Aug (not 15, 22), 1pm, £8.50 (£7.50). Dan and Jeff take on all six of the Harry Potter novels (and include a sneak peak into the seventh) in an irreverent and goofy, low budget, high humour show. Ages 6+. 'Part of the Edinburgh Festival Fringe 2007'.